Our homes are our safe places. We don’t really expect to find mysterious objects in our homes, but one London woman took to Twitter to figure out what the hell just fell out of her chimney. This story was originally published on May 29 at 12 pm. See update at the end of the article for the final conclusion on what the hell fell out of that chimney. Melissa Harrison didn’t let this mystery stop her in her tracks. She’s spent the last couple of hours documenting a number of experiments to determine its origins, which included hitting it with a hammer six times (until it finally shattered) and trying to dissolve it in water. There are a lot of theories as to where the #chimneyegg came from. A feasible theory suggests that it might be a bezoar stone, which are solid masses from the intestines of animals such as sheep or goats and that were used centuries ago as a poison cure-all. Twitter user lucyinglis stated that they were kept in chimneys for superstitious and pagan purposes, although I wasn’t able to confirm this elsewhere. Another Twitter user hypothesized that it could’ve been an object eroded on a beach and dropped into the chimney by a bird. Other less helpful suggestions have included it being owl poop, reindeer poop, and builder’s putty. Harrison is taking all of this is in stride though. Update: After getting inundated with suggestions and possible answers, Harrison posted on her blog with the final answer. 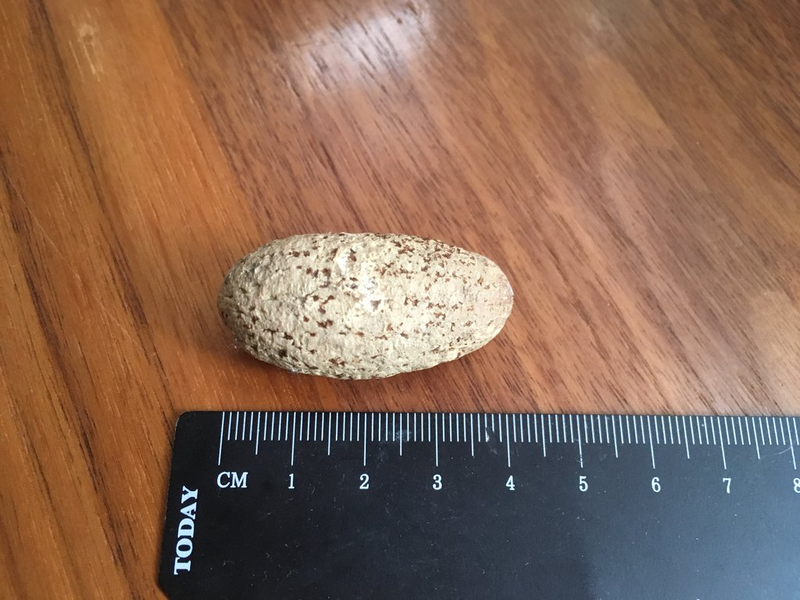 Apparently, the mysterious egg-shaped object is bitter kola, which is a nut normally found in West Africa that can be chewed as a stimulant. At last, we had an answer – all down to the amazing power of Twitter! Admittedly it wasn’t quite as interesting as a bezoar stone, but it was considerably more exotic and exciting than a bit of old putty; and it made sense, as there is a vibrant West African community around where I live in South London. The only remaining mystery is this: who (or what) dropped it down my chimney? !